A short while ago we started Movie Night at the MooreBabies household. It is typically Saturday, unless we are otherwise engaged (such as this past Saturday was the Easter Egg Hunt at the baseball game)... so we had Movie Night on Friday. 1.Mix together the tomato paste, water, and olive oil. Mix well. Add garlic, salt and pepper to taste, oregano, basil, and rosemary. Mix well and let stand several hours to let flavors blend. No cooking necessary, just spread on dough. So now, Movie Night has turned into Pizza & Movie Night! 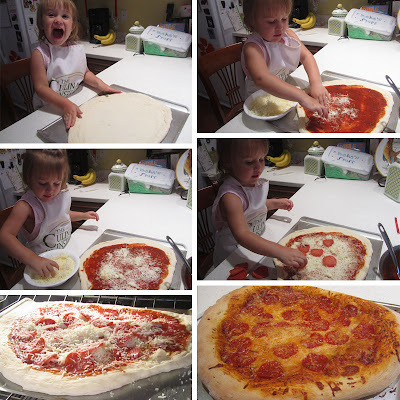 Although I don't think we are going to make a FULL pizza each time. The dough instruction label said that it could be frozen, so I think we'll just use half or a third of the dough. Another reason to use half or third of the dough is because I didn't get the dough thin enough on the edges, according to hubby we need to learn how to toss pizza dough (yeah, I'll let you know how THAT turns out). For next time, (if I use this same recipe) I will use a little less oil and rosemary. The rosemary was REALLY strong to me. Also, maybe different cheese... I bought the Kraft packaged shredded mozzarella cheese. I am NOW on a quest for the BEST pizza recipe. So do you guys have any good pizza recipes that you use? Sauce, dough (when I get there), topping combos! Let me know, I'd LOVE to try them out. Wooo hoooo! 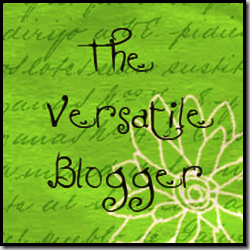 I have been given the Versatile Blogger award... score :) Alright, here are the rules! Amy over at Sitting at our Kitchen Table, thank you so much.... you ROCK! She has some sweet recipes (the Red lobster biscuits are to die for), fun Holiday projects, and cute kids crafts that I can't wait to try out with my little ones when they get a little older. Definitely go check her out. I'm a lefty... in fact, I'm like the only lefty on either side of the family as far as people can remember! I like try to work out 4 times a week. The only reason I do this is because I'm trying to 'get that body back (I) had at 17', Trace Adkins. Funny story... well more so annoying.... anyway, my ipod ran out of battery today in the gym, and as I'm working out the only part of a song that replays in my head is "she wants that body back, she had at 17..... she wants that body back she had at 17"
I used to hide bowls of jello under my bed (and we know what happens to old jello) as well as clothes, etc when I was younger... yet now I can't stand clutter and I work my best to be clean and organized. I was on a Junior Olympics gymnastics team when I was young. I'm slightly afraid of the ocean (undertow, sharks, and jelly fish, ya know), but love the lake. My pointer toe is longer than my big toe. Go check out these fabulous blogs!! 4. Contact your everyone and let them know they've been awarded! Ok... the awarding didn't take the time... it was the "let them know they've been awarded" that took the time! Ok... so that may be a little dramatic... ok, let me rephrase that. My worst fear, in regards to embroidering for money, came true. Blech. Up until now, the embroidery I have done has been for gifts... my theory is that if someone gets it for free as a gift, they can't complain about it, am I right? I'm right. 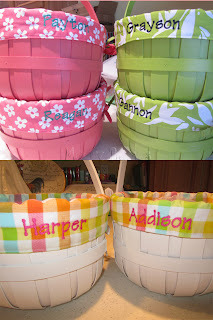 Just the other day, one of my fellow Junior Leaguers sent me a message saying she remembered (from facebook) that I have an embroidery machine and would I be able to embroider Easter basket liners for her daughters... she'd pay me. I said, sure... let me check out the liners to make sure I can physically do it. Everything looks good and she gives me a check and I take the liners. I set up the names and head over to my mother-in-laws to embroider. After about an hour... voila! 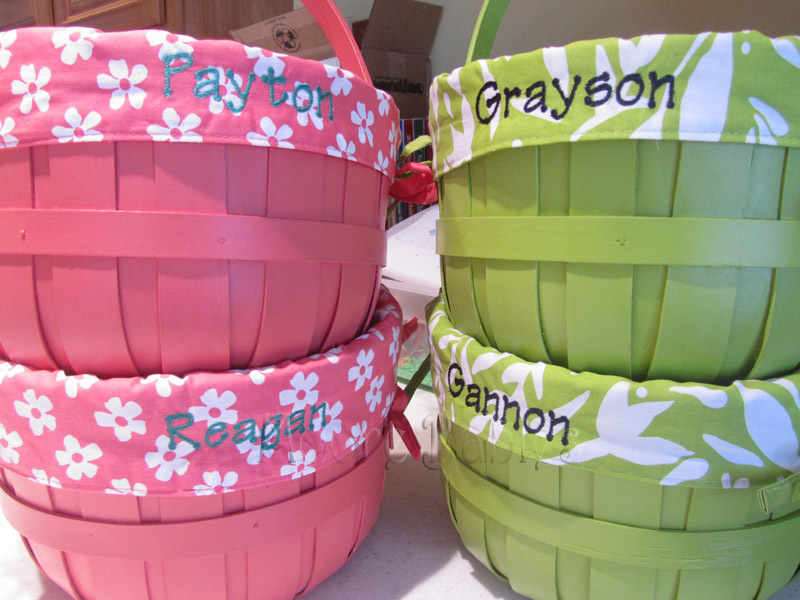 2 personalized Easter basket liners. Completed. I get home and see a message from another fellow Junior Leaguer and best friend of first Junior Leaguer. In short she heard that I had done the Easter baskets and could I please please please please do some for her kids. No problem! I get the baskets from her, set up the names and get ready for embroidering. I was pretty hesitant about picking the embroidery color because these liners (from Target) are kinda BRIGHT pink and white (huge contrast there) for the girls, and a olive green and white for the boys. So I choose a navy blue for the guys and I try a teal green for the girls. Pink and teal looks good together, right? Not. in. this. case. So I embroidered the girls baskets and .... oh no! I really can't see the names. What am I going to do? I have already unhooped them and don't have the skill to rehoop them... oh boy. Plus, these baskets are $12, do I go buy new ones and eat the cost?! I rush off to my embroidery store and talk to "my" lady. 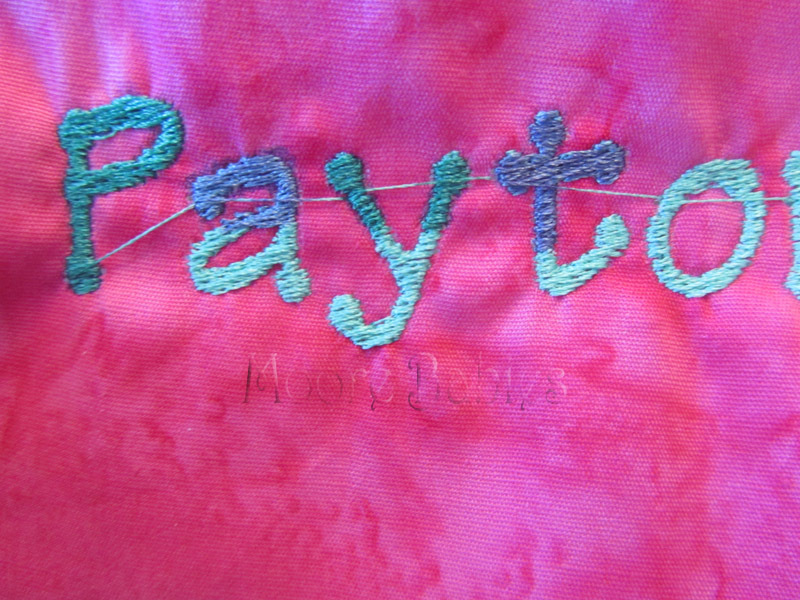 After checking out my options I decide that I can use a fabric pen to darken the name. I embroidered myself a "Tester" piece of fabric and get started with the pen. I used green ("P" and half of "Y") and purple (half of "a" and "t"). The purple seemed to bleed to me, although I could have just goofed on the "a", but I decided to go with the green. After a few coats I decide it's looking pretty good better and the end result is a happy customer! Phew! I for one am kind of glad that Easter is over, well maybe not exactly Easter, but this past week. Sheesh! But we sure had fun. 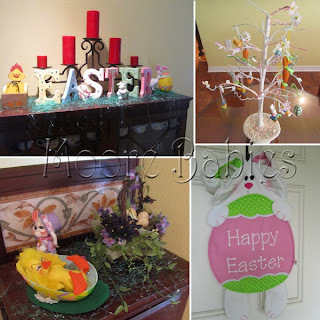 Let's start with the decorations -- I only have a few things and didn't make any Easter decorations, so this is kinda boring! Just a Joann front door sign, Annalee dolls (thanks to my brother), an Easter tree (thanks mom), and some other odds and ends. 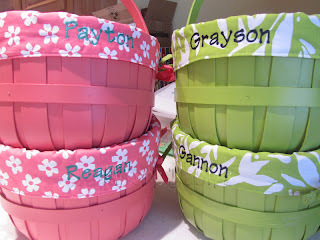 I was commissioned to embroider Easter basket liners for some Junior League friends' kids (more on that later). 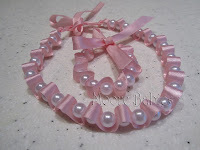 Lastly, I made a ribbon & pearl necklace and bracelet set for one of my friends daughters to put in her Easter basket. 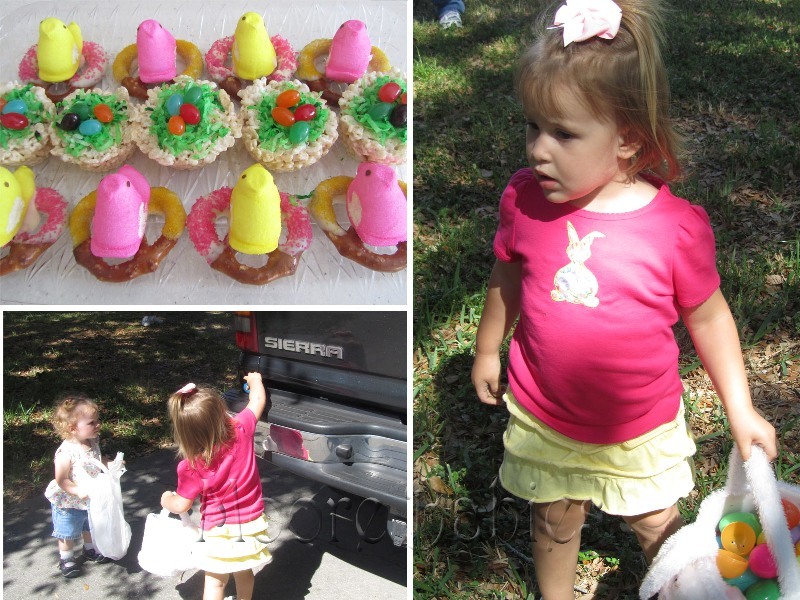 Our Easter celebration started last week with my neighborhood Easter Egg Hunt (which Charlotte LOVED). I made some treats and we had a blast. ON Easter, we got up and did the Easter baskets, made pancakes (hubby used Baking Soda instead of baking powder.... not the same thing. haha), got ready for church and did photo shoot #1, church, lunch with the in-laws, home for an Easter egg hunt and photo shoot #2, and LASTLY, the girls got a HUGE (maybe a little too big) gift from Mimi and Grandpa for Easter... the Pottery Barn Kitchen. (Thanks Shannon for reminding me...) Does this yellow dress look familiar? Well this just happens to be the Shabby Apple dress that I won back in March! 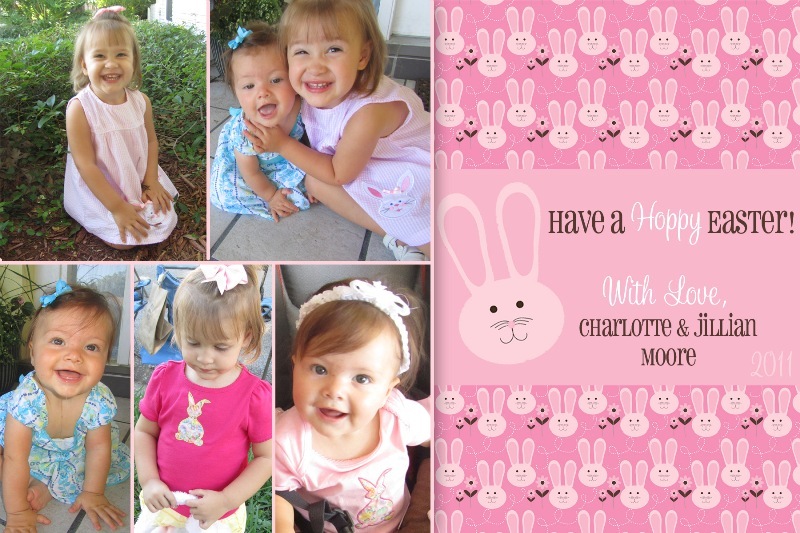 I decided Easter would be their perfect debut for it. 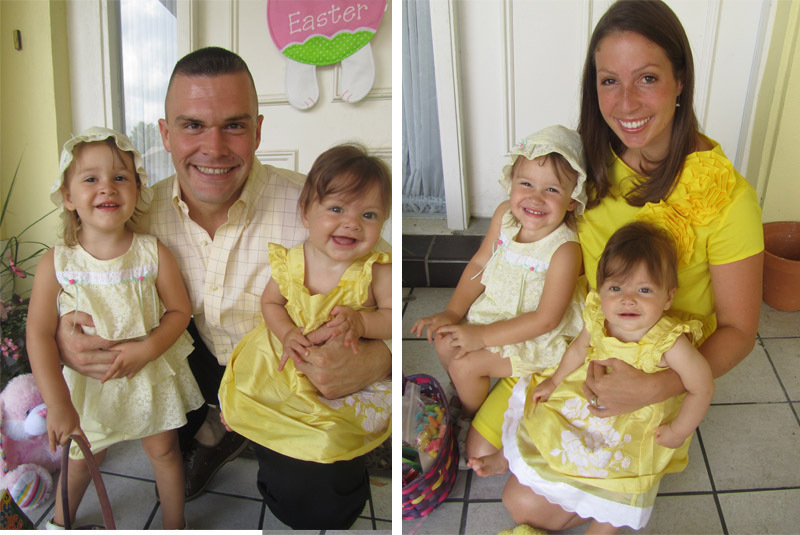 Especially since I dressed the entire family up in yellow!! PHEW, what a day week! Also, some of our friends here throw a Masters Party every year... so they are perfect for that. But other than those select events, these socks just don't get much use, ya know what I mean? However,I just could not get rid of them because a few years ago I saw a How-To on making knee high socks into baby leggings. Ever since that day (like 2 years ago) I have held onto these socks saying that I would make them one day. Well that one day FINALLY came! Now, this isn't going to be a real tutorial because there are some out there, like here, here, or here. But here are some quick steps that I took. 1. 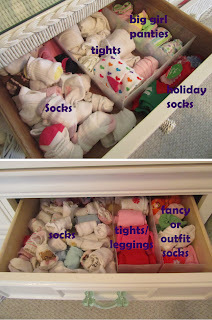 Get knee high socks, scissors, and thread (or sewing machine... "my" sewing machine is 20 min away at my mother in laws). 2. Cut at the ankle, after the heel, and before the toe. 3. Discard the heel and toe. 5. Put folded "foot" piece around the cut ankle part and line up all 4* edges. * 2 from the folded over "foot" piece, 2 from the cut ankle part. 6. Open it up and you will have 3 edges that you need to pin around -- 1 from the cut ankle part, and 2 from the folded over foot part. Ok, that sounds much more difficult than it really is. Maybe I am not explaining it right... hope the picture helps. 7. 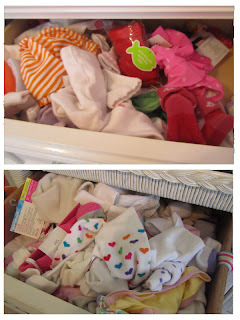 Machine or hand stitch around your top - sewing together 3 sides all around the sock... are you with me here? The sewn part is at the top of the picture and the grey part is what used to go around your calf. Looking back, I should have kind of measured my little(st) ones legs before sewing because these are kinda, sorta long on her and after 10 minutes of her wiggling, rolling, and scooting on the ground they are at her ankles. 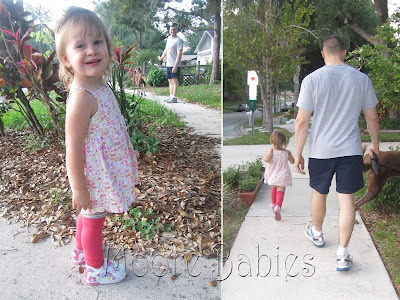 Charlotte let me put them on her for last nights walk -- which works out well because this child falls down just about every night while running! There you have it... my disclaimer. This is by FAR one of the best Tilapia recipes that I have tried; the tomatoes add this wonderful sweet and juicy-ness to the Tilapia and the lemon drizzled on top after the baking is superb!! Best of all, it is SUPER easy to put together. 3. Layer the spinach, onion, and tomato slices on top. 5. Sprinkle (or coat... I like cheese) with the fresh Parmesan cheese. 7. Remove from oven and drizzle with some lemon juice (I used a bottle of lemon juice and just drizzled over tilapia... maybe 1T worth. 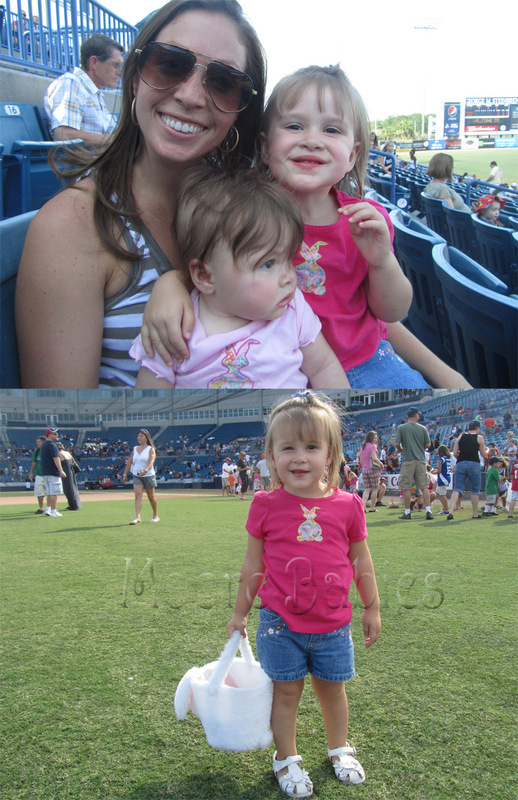 Project #1: Print out 5 pictures to make month-by-month frame up-to-date - Completed. Project #3: Organize the (kids) sock drawers. Project #4: Embroidery. Completed: birthdays; showers will be posted once recipients have gotten their gifts. I kind of like making a list for myself... it sort of gives me some accountability. (not that you guys REALLY care... but still). Now that the hubs is home... I'm going to have less time for crafts (and more quality family/hubby time)... but I think I'm going to put 1-2 crafty items on my list that I have to would really like to complete that month. Now to decide what to do... oh the pressure! Any suggestions?